Posted January 3, 2018 by Staff Writer & filed under City Hub. There is no doubt that the 12 km Central Business District and South East Light Rail project will deliver a lot of benefits when it is completed, but for many along its route across Surry Hills, it promises to deliver another year of disruption, dust, noise and business downturn. The line starts in Circular Quay, dissects Surry Hills, crosses Moore Park and cuts along Anzac Parade on to a loop that runs around the south-eastern suburbs of Randwick and Kingsford. Its many controversies to date include the degradation of businesses along its route and the destruction of hundreds of mature trees on the edge of Centennial Park and Anzac Parade. The $2.1 billion project that commenced construction in 2015 has seen much of the CBD section near completion, but it seems that project’s Spanish-based constructors, Acciona, along with its ALTRAC consortium partners and Transport for NSW, did not count on the difficulties of cutting a swathe through one of Sydney’s oldest inner city suburbs, Surry Hills. “There have been significant challenges during light rail construction, including the discovery of more than 1400 unknown utilities along the alignment,” an ALTRAC spokesperson, said. The Surry Hills zone referred to is on Devonshire Street between Chalmers and Elizabeth Street. 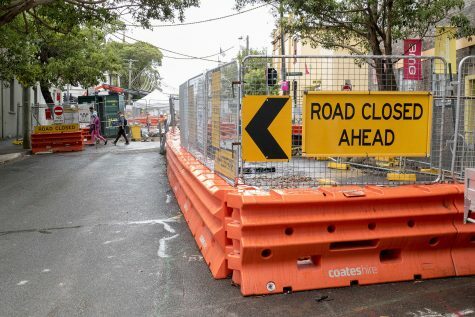 But not all of the project’s difficulties lie with things hidden underground, as this story will show that businesses and residents have also been impacted, and are often unfairly dealt with by the constructors and Transport for NSW. The Precinct is Surry Hill’s peak business organisation and as such has its fingers on the pulse of business health in district. Harris names the much loved Book Kitchen cafe and clothing store Surrounded By Ghosts, which has decided not to renew its lease, as just two businesses who attribute the construction work as being the major factor for them ceasing operations. Manny also added that he had recently appeared on Channel 10 to alert the community that a Telstra pit in front of his business had to be opened for the Light Rail construction, resulting in the release of asbestos dust. Harris was more upbeat about an innovative program launched by the Precinct and Transport for NSW into the affected Surry Hills areas after a successful trial in Randwick, which issued $100 gift vouchers daily. “Over 305,000 were reached through our 12 week social media program and we achieved 730,000 views, and a lot of those businesses were able to in by tagging and reposting,” Harris said. Transport for NSW said that 54 businesses along the route have applied for assistance and 34 have been approved for rent assistance. Over at Parkham Road, residents are totally frustrated with the lack of responses to very vexing questions relating to noise and dust mitigation, construction hours and structural damage to their homes. In response to residents’ ongoing concerns, in early November, Jenny Leong, along with City of Sydney councillor Angela Vithoulkas, raised questions at a regular Sydney Light Rail Roundtable regarding construction hours, dust and noise mitigation, adequate night time coverage of worksites and structural damage to properties. “We have been contacted by a number of concerned residents who found themselves making complaints about private contractors that were going un-actioned, so we arranged for representatives from Transport for NSW to meet with around 20 residents so that they could express their concerns, rather than being sidelined by contractor who has a lot less concern for our community, Jenny Leong, MP, Newtown said. For the residents of Parkham Road, their woes began with the demolition of the nearby Olivia Gardens apartment buildings so that the site it could be used as a depot and fill zone. Olivia Gardens was once an active part of the Surry Hills community, but in 2014 it was acquired by the State Government, much to the consternation of the more than 70 public housing residents who lived there, and now finds itself in the middle of another controversy. In 2016, ALTRAC decided to change the schedule of works along the three work zones on Devonshire, Elizabeth and Bourke streets. Rather than approaching the works in three stages, as originally planned, in the first quarter of 2017, ALTRAC began work on all three zones simultaneously. This meant that the Olivia Gardens site had to be levelled and compacted to receive tailings from three construction zones at once, and the Parkham Road residents say this is the cause of their buildings’ structural damage. Barbara Best was the first resident that City Hub spoke to about damage to her property. “I have owned the house for over three years and have had none of these issues until they started demolishing the Olivia Gardens’ site, Ms Best said. All of the affected houses in Parkham Road are turn of last century terraces with adjoining walls. “Quite a number of us have approached Acciona and ALTRAC by letter, and their response is that they haven’t caused the damage, and that it is due to the age of the buildings and the settling of the ground,” she added. Carsten Koehler, Barbara’s near neighbour, lives adjacent to the Olivia Gardens site, and claims that he first noticed damage to his property in September/October 2016, despite his house being substantially renovated in 2014/2015. Acciona sent out a building inspector, but Mr Koehler claims that he had to chase the report for months. “Finally I got a very convoluted and illogical letter where they disputed any responsibility,” Mr Koehler said. The length of time that it took Mr Koehler get a response from ALTRAC flies in defiance of Transport for NSW’s own Construction Environmental Management Plan guidelines that clearly states that ‘ALTRAC provide Transport for NSW with a daily report of complaints over a 24 hour period’ – and that they are also liable to respond to phone complaints within two hours and email complaints within 24 hours. Also flying up the pole of the illogical is the fact that ALTRAC have dismissed with a cursory glance any responsibilities to homes that have survived for over 100 years without major structural damage. With so much construction work going on around Sydney you would think that all parties concerned would have better lines of response in place. Once more the arrogance of Government and developers shows through, and no better example of this comes to mind than the slap-down of battling George Street shop keepers Mark and Jennifer Duff by Transport Minister Andrew Constance on the opening of the CBD Light Rail section in December.